It’s time for Bake Along again! I missed the previous one due to my laziness in trying to make puff pastry… oops! 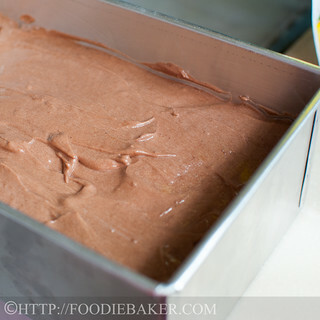 So when I see that this is bake is a chocolate cake, I know laziness will not be an excuse for me not to bake this cake. The cake is described as “intensely chocolatey” by Bon Appetit, but when I see the list of ingredients – I have my doubts. The recipes uses only cocoa powder and even though it is mixed into a paste which is said to enhance the cocoa taste, I don’t think that this will be any where near intense. I was right, it was a normal chocolate butter cake. Truth to be told, I was a little disappointed with the cake, but it’s still a good cake, just not my type of cake. However, I must say the tall loaf looks really good in the photos! The light hint of honey in the cake differentiates itself from the usual chocolate butter cake, so it’s still definitely worth a try if you’re looking for a new chocolate butter cake recipe. 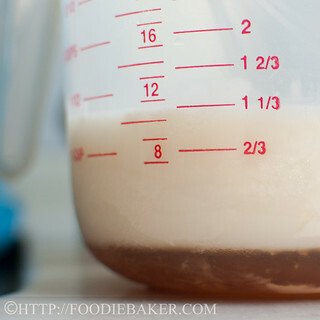 1) Combine honey, milk and cream together and let it come to room temperature.. 2) Whisk the dry ingredients together. 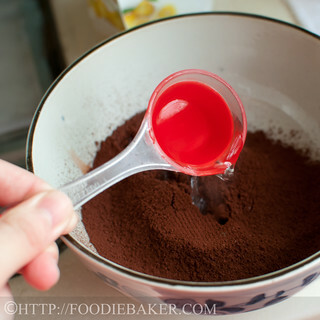 5) Then whisk until you get a paste. 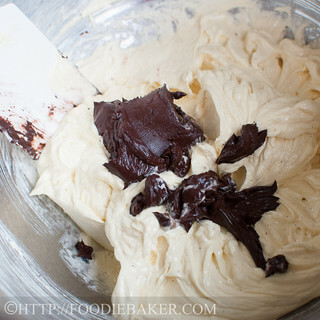 6) Cream butter and sugars together. 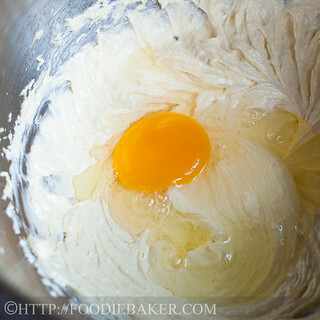 7) Add in one egg. 8) Followed by the second egg! 9) A little vanilla to get the flavours going. 10) Then in goes the cocoa paste. Mmmm. 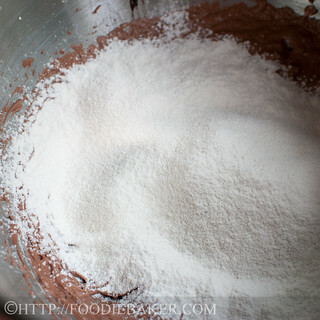 11) Some flour mixture goes in to thicken the mixture. 12) Then drizzle in the liquid. 13) Then flour. 14) Then liquid. 15) And lastly flour again - I almost wanted to use the same photo for all 3 shots of flour, but I decided not to be so lazy! 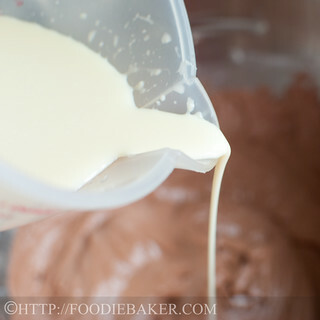 16) Transfer the batter into a greased and lined tin. 17) Sprinkle the almonds. 18) Then bake away! Click on the froggie below to see all other attempts on this bake! Preheat oven to 175 degrees Celsius. Butter an 9x5-inch loaf tin or 7x7-inch cake tin (3-inch in height) and line the bottom with parchment paper. Set aside. 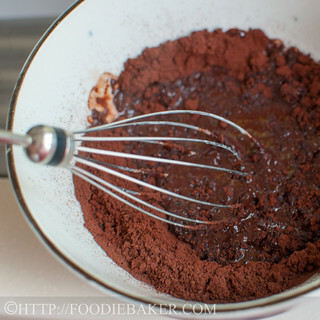 In a medium bowl, whisk together flour, baking powder, salt and baking soda. Set aside. 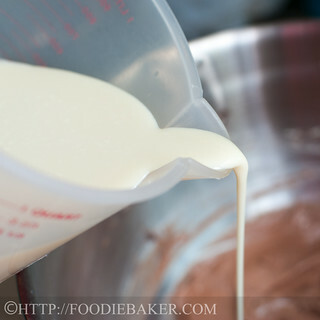 In a separate bowl, whisk together cream, milk and honey. Let the mixture come to room temperature. Set aside. 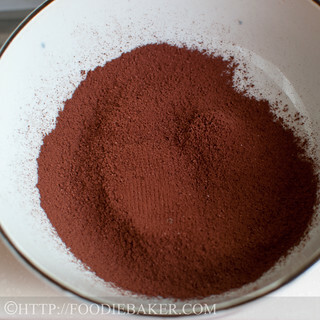 In another small bowl, combine cocoa powder and hot water together. Set aside. 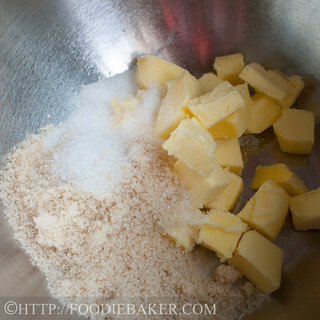 In a large mixing bowl, combine butter, caster sugar and brown sugar. Beat with an electric mixer until pale and fluffy, scrapping down the sides occasionally. Add in the eggs, one at a time, beating well after each addition. Beat in the vanilla and the cocoa mixture. 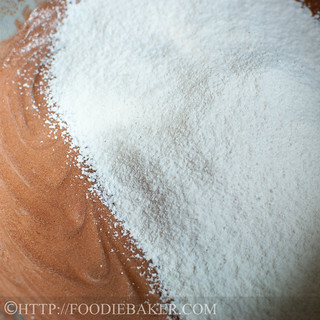 Sift in ⅓ of the flour mixture and beat in on low speed until incorporated. 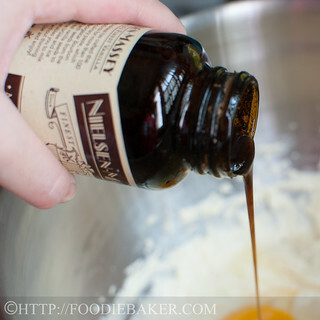 With the mixer running on low speed, drizzle in ½ of the liquid mixture until incorporated. 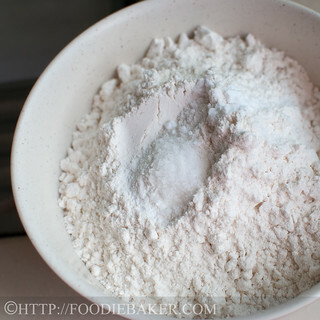 Sift in ½ of the remaining flour mixture and beat it in. Beat in the remaining liquid mixture and finally the flour mixture. 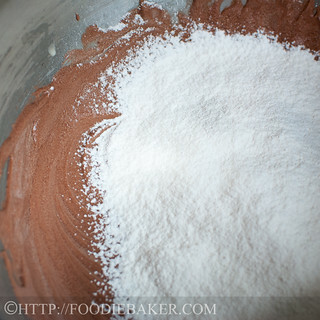 Transfer the batter into the loaf tin. 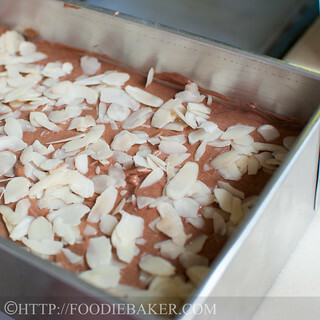 Smooth the top and sprinkle the almond flakes all over. Bake for 1h 30 minutes, tenting the top after 1 hour to prevent the top from getting too browned. Let the cake cool in the tin for 15 minutes. Turn it out and let it cool completely on a wire rack. Slice and serve with tea / coffee. The only complaint I have is that this cake takes extremely long to bake – I used a slightly smaller tin (8×5-inch) and I ended up baking it for 1 hour 30 minutes. I tented the cake with aluminum foil after 45 minutes. My resulting cake is very tall, so if you want a shorter cake and a shorter baking time, go for those dimensions I listed above. I substituted the sour cream for thickened cream. You can use yogurt if you don’t have sour cream or thickened cream on hand. 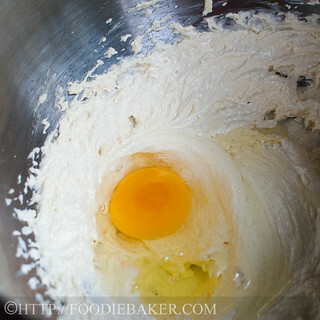 The Wet Ingredients need to be at room temperature (or same temperature as the butter mixture) before it is added in so that the butter mixture will not curdle. Add in up to 1/2 cup of chocolate chips if desired. You baked your cake so well. I love the texture of your cake, it looks fine and moist. As always your tutorial are very helpful to me. Prior this bake, I was reading its reviews at Epicurious. Some said that it is good but some didn’t like it at all. Despite all, I’m happy to give this recipe a try. I think you are right saying that it is not intense enough in its flavours and I will like it more if the texture of this cake is smoother. 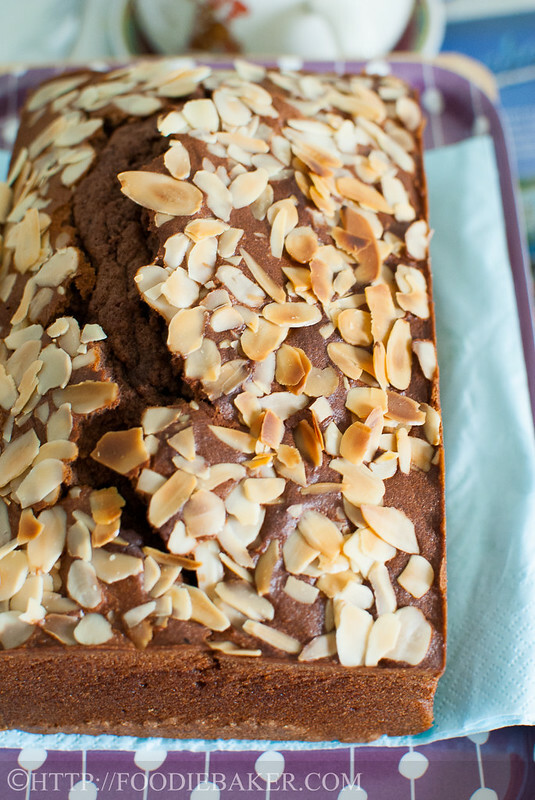 ps: I do love your almond topping! I am sure non-chocolate lovers will like this chocolate cake. But perhaps if you used chocolate chips as well, it could have been more to your liking! 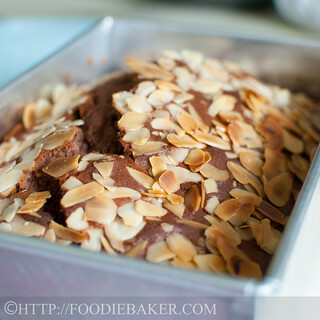 The almond slivers look like the perfect topping! I reckon rich chocolate cakes should at least have some chopped dark chocolate in it. Your cake looks gorgeous though, love the way you styled the photos. I don’t think I’ll join this one as I have to avoid as much as possible to keep my voice at a good condition. Oh my, your photos are just lovely. 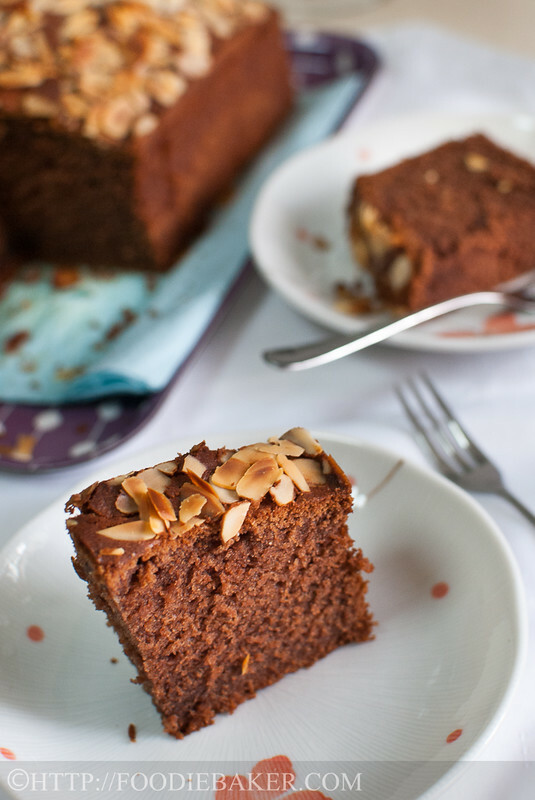 I do love how the cake is topped with the almonds before baking, giving it a little visual interest and the honey sounds like a nice addition to the batter. I’ll be looking to see the recipe with a more intense chocolate flavor soon (although this looks pretty good). Hmm yours look gorgeous. I used another flatter and wider tray, try to make something different. I’m editing now hopefully can post it later. Will note down your notes. Thanks for sharing your valuable opinions. The cake may not have been to your taste but you certainly made it look delicious in your wonderful photos. Thank you Jeannie! Glad you like this cake! I just wished it would be a bit more chocolatey! Thank you Johnny! Great improvisation on using the measuring jug! In the past I actually used a tripod, but it made cooking/baking really time consuming, so nowadays I try to cook/bake while it’s still bright and shiny so that I can just snap and go. The cocoa content is definitely not enough, I wish it’d be more intense! Yes, I do agree, this cake is not chocolaty enough, but nevertheless, it is a nice cake, very moist and tender. 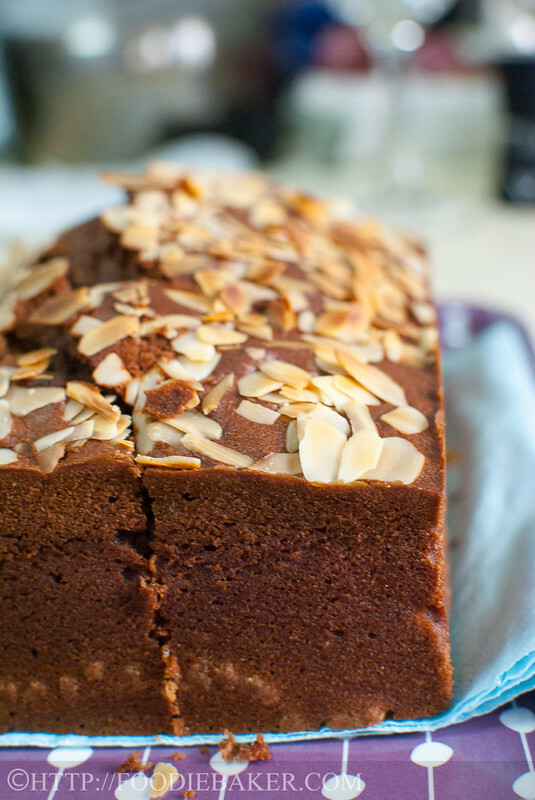 Your cake looks great, especially with the flaked almonds over the top! Oooooh, these are gorgeous photos of a gorgeous loaf! It looks so moist, rich and chocolatey! hi jasline, i echoed your opinions abt this cake. Though it’s not really a disappointment, i wish the flavour of choc could be more intense and richer. The firs time i did it, i accidentally missed out the choc chips, the 2nd time i did that with choc chips, it was a littlle better but still not rich enough for me :D. Always glad to hv you baking along with us. Especially love your last photo! The DOF is just great. And your step-by-step, as always. I’ve just realised I can get some step-by-step by using an upside down measuring jug on the hob for support. That way I’m starting to get clearer photos. Anyway, from the little I know about using cocoa powder that isn’t nearly enough for a cake this big. However, I do like the wet ingredients. 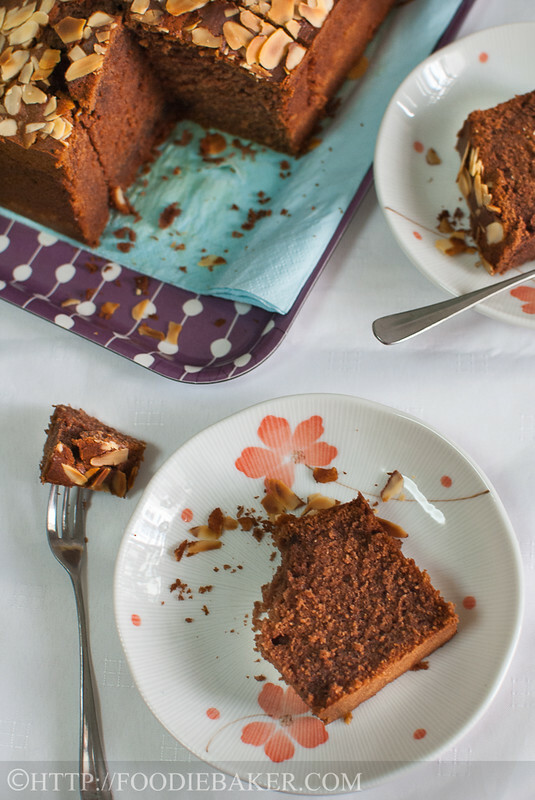 The photographs jump off the screen, the cake looks moist and delicious. I have never had chocolate pound cake and I must try this.